The Rio Grande is a classic gunbelt with holster. Beautifully border tooled with traditional design the gunbelt features spots on the bottom of the gunbelt. The holster features two diagonal bands studded with small silver spots and the same spots on the holster skirt. Available in straight left draw or straight right draw, choice of Black, Brown or Natural and fully lined. Fits most single and double action revolvers. **Gun and Bullets are not included. To obtain the correct measurement for your gunbelt please refer to the diagram below. CALL if you're not sure how to measure!. 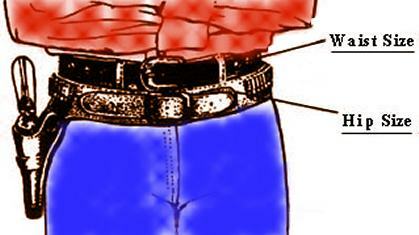 Measure around your hips approximately 2 inches below your pants belt. Please note that gunbelts are measured by hip size.